I got the next batch of Log Cabin Pineapple blocks done. I finished another 27 (26 shown) 1 needs a little hand fix up. There is lots of pink scraps in these blocks so I am adding this to Soscrappy's link page for the Rainbow Scrap Challenge 2015. Pink is the colour for February. I find I like to do these in assemble line order. Add the red center to all and the first bit of white, then the next piece. However it is taking me many many days and hours to do a set of 25 to 27. The pattern is from Bonnie Hunter's book String Fling. I got my mom, Betty, the book for her Birthday over a year ago, it is signed by Bonnie. I think that mom and I may end up making most of the quilts in the book. 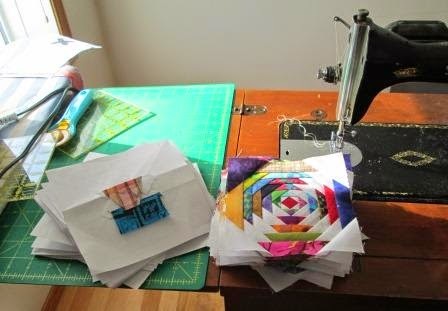 If I make the quilt the size in the book, I need 224 of these little 4 1/2" blocks. So I thought I would do sets of just over 25 (in case one block gets lost or cut). So far I have 52 blocks complete out of the 224. I got started on the next 27 blocks. I have been doing this in the living room on my older singer in the cabinet. I can watch TV with the family and dogs. I do not let the dogs in my sewing room. Best go, I have Rally obedience class with Gemma later today. This quilt is full of movement. All those little pieces. It's pretty impressive. The quilt is turning out great. I love the pineapples with the white fabric. Happy Valentine's Day to you too, Cathy. Love the pineapple. It's coming along quite well. These are just gorgeous! Like your approach to them. I have to say: wow! that's dedication! 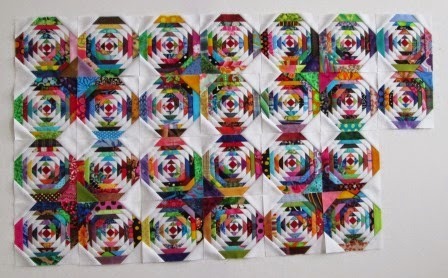 I don't think I'd ever be tempted to make a quilt that large with such small blocks. it is very beautiful, though! Very nice! Someday I definitely want to make one of these. What a cheerful quilt this will be someday! Oh, my! How gorgeous. Those blocks are 4.5 inches with all those pieces? Wow! Oh my goodness, so many tiny pieces to use up. Definitely a long term project. The pineapple block certainly gets a lot of strings out of the way fast. Great work. I love your little paper pieced pineapple blocks. I have that BH book. I love the look of pineapple blocks, but I have never had the patience to cut out for one or stitch so many tiny pieces . . . kudos to you!!! 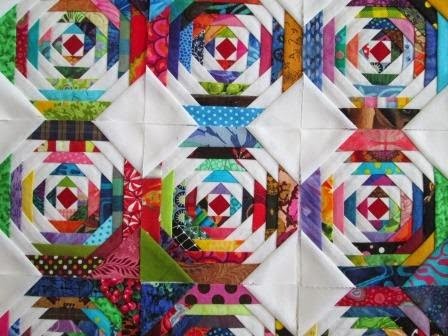 Are these paper-pieced like the fractured pineapple blocks that I am doing? What wonderful blocks! Great idea to work on smaller sets.